The image on the left shows highly relevant results for “leather boots” based on SLI Learning Search. 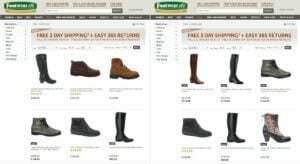 The image on the right shows how SLI ESP personalizes the results for “leather boots” in real-time based on the customer’s preference for women’s shoes. SAN JOSE, Calif., Oct. 4, 2016/PRNewswire/ – SLI Systems (SLI.NZ), a global leader and provider of e-commerce solutions and services for mid-to-large-size Internet retailers and B2B sites, today announced SLI ESPTM. The new cloud-based software instantly and dynamically personalizes the shopping experience for both first-time visitors and loyal customers, continuously learning, predicting and presenting in real time the products customers are most likely to buy. Available today, SLI ESP increases conversion rate and revenue per visitor by delivering 1:1 personalization and relevance to shoppers. Powered by the SLI Buyer EngineTM, the company’s patented machine learning product discovery platform, SLI ESP adds contextual personalization to SLI’s already highly relevant results. “Using SLI ESP, Footwear etc. was able to personalize and display products in real time, resulting in a 10% increase in revenue per visitor to personalized search and navigation pages. We also saw a 5% increase in conversion rate and average order value (AOV). The impact on sales has been meaningful, but it’s also clear that we’ve made it easier for shoppers on any device to find the products they’re looking for – that’s key for differentiation and loyalty in our segment,” explained Mike Baranov, VP Online Operations, Footwear etc. “The future of commerce is predictive. With SLI ESP, SLI is arming online retailers with a deeper arsenal for competing with Amazon and mega merchants through highly relevant and personalized experiences that quickly make an impact on their bottom line,” said Chris Brennan, CEO, SLI Systems. SLI ESP is designed to increase conversion rates, items per purchaser, revenue per purchaser, and other KPIs, by distinguishing the interests of the user based on behavior to personalize search results and product recommendations. These personalized results are even more critical to streamlining purchases on mobile devices where shoppers bounce quickly if they can’t find what they want to buy. Seamless user experience – Dynamically personalizes results during the shopping session to match shoppers’ needs in real time. Custom-tailored for each site – Delivers the best experience for your shoppers based on what matters most to them. Reduces friction for mobile shoppers – Shortens the path to purchase on any device by predicting what shoppers are looking for rather than requiring them to filter results. Works with SLI Learning Search® and SLI Learning Navigation® – Provides a personalized experience from the moment shoppers arrive on the site, and every time they come back. Easy implementation – Just add a bit of code. SLI Systems (SLI.NZ) accelerates e-commerce for the world’s top retailers by generating more traffic, converting shoppers into buyers and maximizing order values through solutions that improve site search, navigation, mobile, merchandising, personalization, recommendations, and SEO. SLI is the most chosen cloud-based site search provider to U.S. Internet Retailer Top 1000 retailers. For 15 years, established brands have trusted SLI Systems to deliver innovative features, knowledgeable service, and SaaS-based infrastructure to delight customers and increase revenue.The SLI Buyer Engine combines user behavior and machine learning to accurately predict what shoppers are most likely to buy, shortening the path to purchase. The SLI Commerce ConsoleTM organizes key sales insight and tuning capabilities into one easy-to-use console. SLI Systems operates on five continents, powering more than 800 websites and offering solutions in 20 languages. For more information, visit www.sli-systems.com.